I love Halloween SO much more because we have these Blood Drip Nail Guides. Blood drips might possibly be my favourite nail look... which might be weird now that I type it out lol! 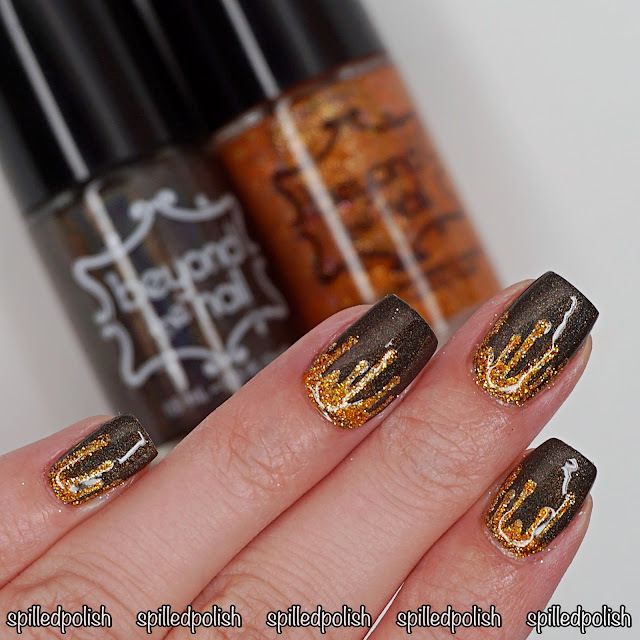 These bloody nails are more Fall inspired rather than Halloween, but it all goes together for the same month. I started with two coats Beyond the Nail - Cabin in the Woods. When it was dry, I placed a Blood Drip Nail Guide over each nail and sponged over it with Beyond the Nail - Jack's Lantern and then followed up by painting over it as well to make the colour pop. I peeled away the nail guides and finished each nail off with one coat of PRO-FX - Quick Dry Topcoat.